As we age, we become more susceptible to injury and illness, which lead to periods of bed rest and prolonged periods of down time. But it is imperative to protect your mental health and quality of life by staying active in the ways that you can. Overbed tables can make a world of difference by giving you the ability to eat and do other activities like artwork, crafts, writing, and games. More than 800,000 seniors end up in the hospital because of a fall and about 300,000 involve a hip fracture, making this item essential. It’s a versatile table that will serve most purposes. The Vaunn Medical Deluxe Tiltable Overbed Bedside Table stands out because of its versatility and ease of use for seniors. The tilt top can be positioned in an infinite number of ways and the height can be adjusted all with very little effort, making this table ideal for senior with reduced strength and flexibility. It has two trays, small one for food or beverages and a large one for times when you need more space. It is sturdy, well-made, and adjustable both in its angle and height with generous ranges for each one. It has four caster wheels to make moving it easy. Two of them lock for added stability. On the downside, the instructions are vague specifically when it comes to installing the trip rod that operates the lever. That can interfere with its usefulness until you’re able to correct it. It’s an issue that the manufacturer should address in future versions of this product. Other than that minor issue, it works as described. It is value-priced for those on a fixed income. Durable and Sturdy Construction--- This overbed table made from high quality MDF and PVC, which could be used for a long term. H Shape Steel Base--- In order to increase the security and stability, the base is made to H shape. So it is not easy to turn over. 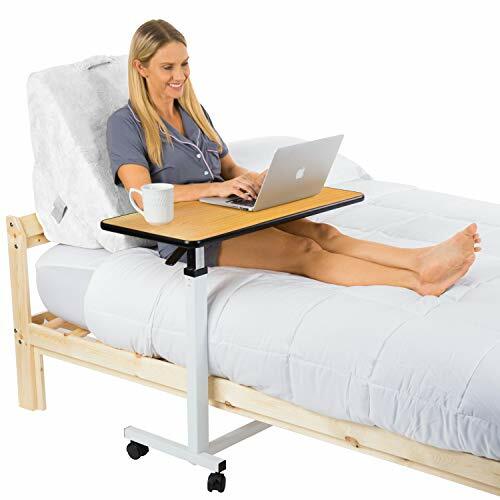 The Goplus Overbed Table is a value-priced product that offers seniors an adjustable surface with a height that extends to nearly 4 feet, which is great for taller beds and furniture. It also has universal wheels, making the table easy to move and maneuver if you have limited mobility. Two of the wheels lock, which is an added safety feature. It tilts forward and backward but doesn’t fold, which means that it is more difficult to hide when you don’t want to use it. It is inexpensive, which makes it accessible to seniors with a fixed income. The table consists of a blend of medium-density fiberboard and PVC. It is a stable with a large surface, provided you have enough room. 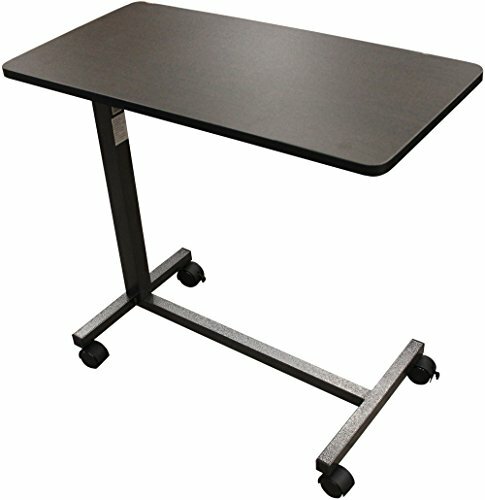 The Dline Overbed Table is an excellent option for seniors who spend time on the computer, need a large working surface, or require a desk space. This product has a wide surface area at 55.1 inches in length and includes 2 holes for wires, making it convenient to charge your computer, phone, or plug in a small desk lamp. You can adjust both the height and width, making it a useful table for beds that range from Twin to California King. It is well-made with stainless steel tubes andfour wheels so that you can move it aside with ease when not in use. The design of the base adds to its stability. This item is large and works best in situations where there is a lot of clearance around the bed. Though functional, it does require a bit more space in your home than other comparable products. However, if you have the room, it serves its purpose well. It’s affordable for what it is too. The frame has the extra support of additional tubes. It’s a well-designed product that is steady and won’t tip. 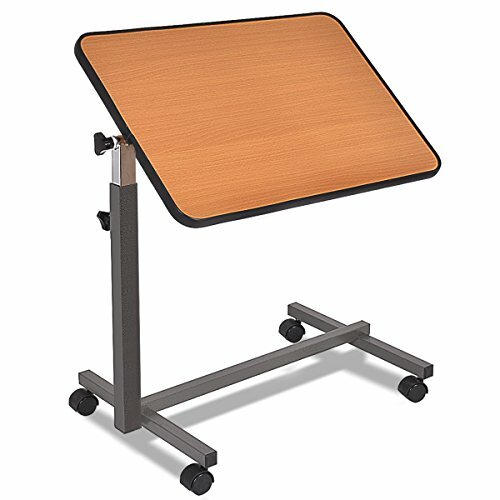 The Carex Overbed Table has a large surface area with a durable frame, making it ideal for eating, reading, or computing. The base is weighted for added stability and reduced risk of tipping. It has four caster wheels and a polypropylene tabletop that allows it to slide easily under a bed frame or wheelchair. The surface is a bit longer than comparable products which we liked. It has all the hallmarks of a quality piece, albeit, a bit more expensive. It has less of an institutional look to it which we found attractive. We only wish that it came in different colors rather than just white. The textured surfaces on the side are a welcome feature so that you can keep a beverage and perhaps a pen nearby. It’s this extra attention to details that we like to see in a product marketed to seniors. It’s an attractive product that serves its function well. The Vive Overbed Table is perfect for seniors because of its ease of use and versatility; it’s great for use by the bed, sofa, recliner or wheelchair. The one-touch adjustment lever makes it simple and easy to change the height to suit your needs. It resembles similar products with its H-shaped base and rectangular tabletop and has a more pleasing appearance with a laminated oak surface instead of plastic.It has a slim profile, making it ideal for smaller rooms and for seniors who need more space to move around. It’s well-made and able to support up to 50 pounds. The laminate finish is easy to clean and disinfect. Like other overbed tables, it has four caster wheels with two that lock. We also liked the fact that the manufacturer backs it up with a warranty. It’s a bit larger than comparable products which give you the extra room you may need for doing tasks that require more space. It’s a well-made product, albeit, a bit expensive. 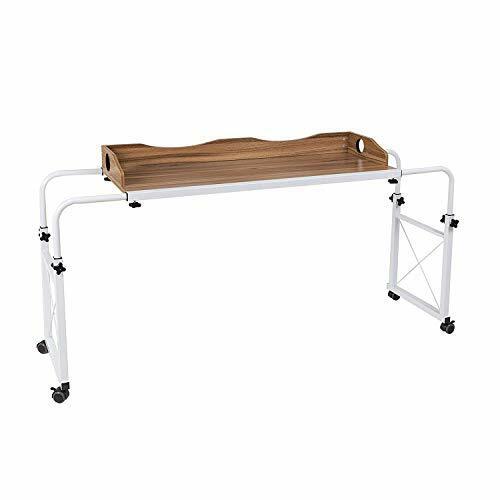 The Amfab Company LLC Overbed Table With Vanity differs from other similar products with the inclusion of a small drawer for storage on each side. This has a number of practical applications for seniors who need to complete a variety of tasks either in bed or in a wheelchair. 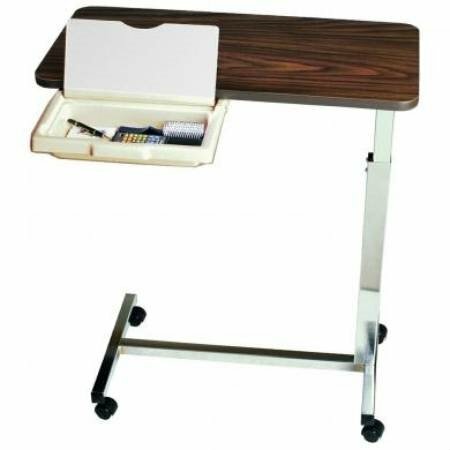 From makeup and toiletries to writing and office supplies, this table is versatile and functional. It isn’t large at 11 inches long by 5.5 inches wide by 2 inches deep but is probably big enough for most things you might need when in bed. It also includes a mirror to double as a vanity. It’s a good-looking product with a pleasing walnut finish that we liked. The size of the table is worth noting too since it gives you a lot of space. We consider it one of the most important features when it comes down to choosing between two products. It is affordable and gets the job done. 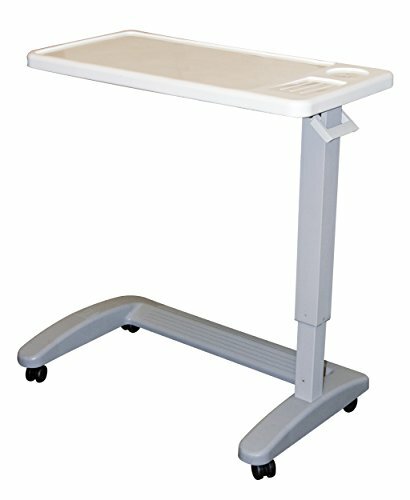 The Drive Medical Non-Tilt Top Overbed Table provides a level surface with a great range of height options, extending up to 45”. 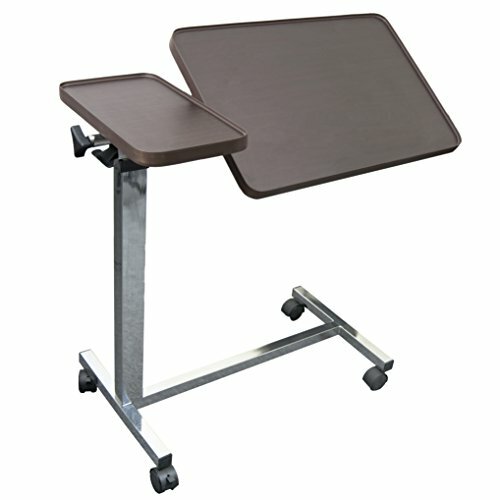 This table has four caster wheels that sit on an H-shaped base, making it a safe and stable option for seniors. It has a laminate finish that is breeze easy to clean and you can adjust the height easily with the slightest upward pressure, making it an excellent choice when strength is limited. The instructions for assembly are straightforward, making the task easy to do. It has rounded edges, making it comfortable to use. It’s more affordable than comparable products with a generous amount of tabletop space. It’s well-constructed and can support up to 40 pounds. Now that we’ve provided an overview of some of the best overbed tables for seniors, let’s delve into the things you should consider when making this purchase. Perhaps the most important feature is the amount of space you have. Most products we researched were at least 24 inches long though many were 30 inches. Either one gives you plenty of room. Another consideration with this feature is the width of your bed to make it’s suitable for your situation. We’d suggest sticking with products that have a lip on the perimeter to avoid spills, burns, and items falling out of reach.. Also, make sure the edges are rounded especially if you tend to rest your elbows on the surface. Many of these products are adjustable although the range may vary. Most likely, you’ll set it in one position and leave it there most of the time. It isessential that the height of the overbed table accommodates the area where you will need it, whether that be your bed, recliner, or wheelchair. Consider the placement of the lever to make sure you can access it easily if you think you’ll need to change the height often. The angle of the table is a crucial feature, especially if you use your table for a variety ofactivities such as reading or using a laptop or tablet. Along with height, it will allow you to adjust it to the precise position you want for the greatest comfort and functionality. You’ll find products that go up and down only or those that swivel all the way around, so make sure the table offers the features that you will need. Storage is another important factor to consider. If it can fold, that will make it easier to place it out of the way when you’re not using it. There are two considerations when it comes to how well your table will stand up to daily use – assembly and cleanup. We prefer products that have clear instructions with an easy setup. That is perhaps most important when it comes to the height adjustment. The mechanism should work smoothly and stay in place. Also, we urge you to stick with products that have at least two locking wheels for added stability. The other thing we pay attention to is the finish of the tabletop. We prefer an overbed table that is easy to clean and disinfect with a finish that can stand up to everyday use. We lean toward laminated wood products since they often look more attractive than a metal surface. Getting an overbed table allows seniors to do many things in bed to help regain independence – from working to doing crafts to eating. While you’ll find many standard features, there are also a lot of other models available that can provide those welcome extras that you’ll enjoy. They are affordable products so that you can get the best one to serve your needs without a huge investment.